Have you kept any memorabilia from your service time? For many years after I got out of the Navy, I kept a set of dungarees, dress whites, dress and undress blues, my pee coat and my dungaree jacket. Some of it stored in my old bunk bag. A couple of years ago I went through it and asked myself why I was keeping all this stuff. So, I thinned it out. The background is material from my dungaree jacket. Other than this, I have a lighter with the ships insignia, my bluejacket's manual, a small piece of the teak wood deck which I collected after some minor damage, a collection of photos, and my memories. I guess that's enough. Not much of my own stuff ... maybe a set of dress blues and my pea coat. I still have some of my dad's gear though. nope never kept anything.. I had enough when I was in. Just my 6 medals. No clothing (uniforms). My Air Medal is the most honorable. Got it as a bomber pilot. Last edited by Falcon; 04-13-2019 at 10:34 AM. When I got out, I had to maintain my sea bag for a year of standby reserve. After that, I just never got around to throwing most of it out. I know a lot of people have bad memories of their time in uniform. I was very very lucky. I never saw any combat. I served with good people, officers and chiefs included. It was an interesting experience, and I had some good times. My only regret is that I had to leave my wife and son behind, and I missed them very much. My little shadow box hangs in my hobby room. Nobody notices it but me. But, I look at it frequently. And, I think about my shipmates and hope life went as well for them. I got out 60years ago. 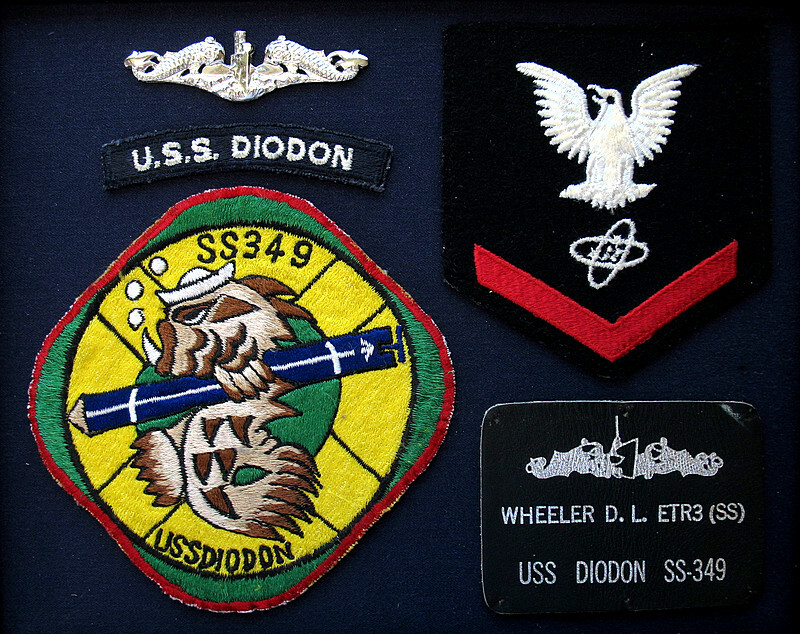 I still have a ship's name patch and a crow (Engineman 2/c). Dungarees? You are dating yourself. It's jeans now. For myself I don't have much but for my father I have kept certificates and framed them. He served in the First World War. I have a medal and a certificate and a photo of my grandson in a color party holding a flag all framed on my wall. I got out in 1972. Four year hitch with Inactive Reserve Duty after. IOW, I was a regular, not a 2-Year "Weekend Warrior" Naval Reserve. Have a picture, with me in, from my Sept. 1968 NTC Great Lakes, ILL Graduation Class. Have all of my ribbons/metals in a display case. Vietnam Campaign, Vietnam Service (w/two bronze stars), a Ship Commendation Metal and a couple of others. Also have a picture of my first ship, the U.S.S. Robison DDG-12 going by Pt Loma in San Diego back to 32nd St Naval Station in San Diego. My first Westpac Cruise to Nam was on the Robison. Also have a nice collector's plate of the U.S.S. Yorktown that we bought when we visited it in the Bay by Charleston, SC.. Very interesting walk around this Carrier. The entire time I was in the Navy, my work uniform was dungarees. So was mine when I worked construction. The point I am trying to make is the change in the language. If you said dungarees to a younger person they wouldn't know what you are talking about. Didn't the US Navy do away with dungarees? It seems the pictures I see now are some kind of camouflage outfit. Bell bottom dungarees were comfortable and looked good. With a light blue chambray shirt that had your name stenciled on the back. The dungarees came in 2 sizes: too big and too small. In Panama some of us made cutoff shorts out of them. Now THIS is customer service !